An Italian shower, more commonly known as a roll-in shower, is simply a shower with no curb or step between the shower and the bathroom floor. For many people in wheelchairs, this feature is not a luxury but a necessity. In fact, curbless showers enable people who cannot transfer themselves to get directly into the shower using a shower wheelchair, with or without assistance. What’s more, in this type of shower, the person in a wheelchair can easily transfer to the shower bench (built-in, fold-down or portable) and then close the shower curtain to prevent their wheelchair from getting wet. Unlike bathtub transfers, this type of transfer does not require the person to lift their legs over the edge, making it a practical and beneficial unit for elderly people as well. Considering all of this, the number of hotels in Québec that are equipped with true Italian showers, is very limited. Below is a list of the principal Québec establishments offering curbless showers. When making your bookings, stress the fact that you require this type of shower, as many hotels have several types of accessible rooms. 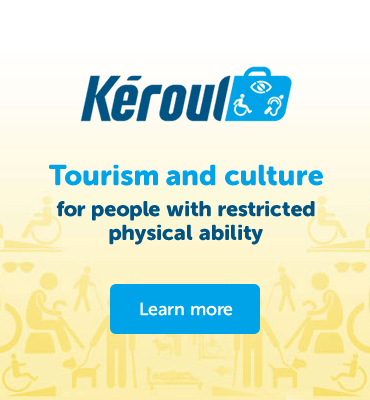 Look for establishments rated accessible, but know that some partially accessible establishments may also be suitable, depending on your needs. In the United States, hotels with more than 51 rooms are required to have a certain number of Italian showers, in addition to a number of accessible rooms with adapted bathtubs (not too high, with grab bars). This gives the guest a choice of shower unit that best suits them—a practice that all establishments should adopt! Under the Québec Construction Code, hotels are not required to have a roll-in shower, regardless of the size of the establishment. They must simply ensure that 10% of their rooms are accessible. The Normes de conception sans obstacles (barrier-free design standards, Régie du bâtiment, 2005, updated in 2010), present the two options—shower and bathtub—as being equivalent, when in reality they are not. Given that most standard hotel rooms are appointment with a bathtub, this is the unit most often chosen in construction, in the interest of uniform design. That said, the roll-in (or walk-in) shower is becoming very popular in interior design, so you can expect the number of hotels offering them to rise.